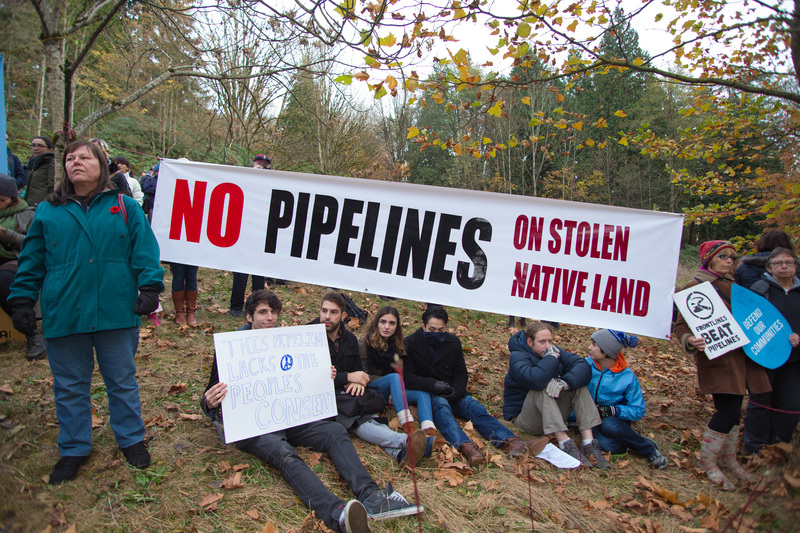 Resource extraction and Indigenous rights have once again come into conflict with the construction of a natural gas pipeline through Wet’suwet’en territory in British Columbia. Coastal GasLink, a subsidiary of TransCanada Corporation, applied for a court injunction in November when clearing for the pipeline route began. The BC Supreme Court issued an interim injunction in December and ordered the long-standing checkpoint dismantled. In response, the neighbouring Gidimt’en established a second checkpoint, which was then brought under the injunction in early January. The RCMP began to enforce the injunction and dismantle the Gidimt’en blockade on January 7, with arrests of 14 non-complying individuals. Wet’suwet’en assert that the project infringes on their Aboriginal title, as the 22 square kilometers of territory through which the pipeline would pass is unceded land. The Delgamuukw SCC ruling of 1997 upheld Indigenous land claims to territory that was never ceded through treaty, which applies to most of the land in British Columbia and includes Wet’suwet’en territory. The Unist’ot’en are a clan within the Wet’suwet’en Nation. Multiple First Nations have signed agreements with Coastal GasLink through their elected councils, including the elected council of the Wet’suwet’en. The thirteen hereditary leaders of the five Wet’suwet’en clans, however, are in opposition to the pipeline. They argue that they were not a party to the consultation process, which began six years ago, making Coastal GasLink’s agreement with their community incomplete and invalid. While band councils are perceived to have authority over reserves and governmental or administrative responsibilities such as healthcare and education, the hereditary leaders assert their authority over the nation’s rights, land, and territory. Prime Minister Justin Trudeau has argued that “the federal government is not the one who should be deciding who speaks for which Indigenous community.” Elected band councils of First Nations were established by the Indian Act and were specifically designed to democratize and undermine traditional governance. Trudeau also admitted that there was much improvement needed by Canada, in terms of ensuring there are “opportunities for Indigenous communities to strengthen their governance models.” Although the Unist’ot’en checkpoint has existed as an obstacle for pipeline projects for a decade, the spotlight on recent events presents one such opportunity. However, for these communities, strengthening Indigenous governance models is not simply a matter of resolving internal tensions over who has the authority to negotiate over pipelines. The tensions between these models of governance in Indigenous communities reflect the assimilationist policies of Canada as a settler colonial state – a reality that continues to shape the relationships Indigenous communities have with the federal government, corporations, and their own traditions. On January 9th, the Unist’ot’en checkpoint agreed to allow pipeline workers access to the road for pre-construction work. Hereditary leaders have maintained that the action represents neither consent nor surrender; it is instead a decision to prevent further violence. With a federal election on the horizon and a warming political climate regarding pipelines and resource extraction in Indigenous territory, Canadians should expect the federal government’s commitments to reconciliation to rise to the forefront of public debate.